Inaugural Address of James Polk spoke fully about the annexation of Texas and used references from history, the Constitution, and philosophy to defend American expansion “as a way of creating and preserving a more powerful Union”. This is a topic suggestion on Inaugural Address of James Polk from Paper Masters. Use this topic or order a custom research paper, written exactly how you need it to be. On March 4, 1845, James Knox Polk, the eleventh president of the United States, gave his inaugural address of 4,801 words under the West Portico of the Capital, in pouring rain with a crowd under black umbrellas. His was the first inauguration that was reported by telegraph and the first that was illustrated in a newspaper. Polk, called “Young Hickory” by his proponents, used his inaugural address to announce the American claim to the Oregon Territory as “clear and unquestionable”. What he neglected to state was the geographical points of that claim, leading to a compromise at the 49th parallel that is still the border America shares with Canada. In his speech he used references from history, the Constitution, and philosophy to defend American expansion “as a way of creating and preserving a more powerful Union”. 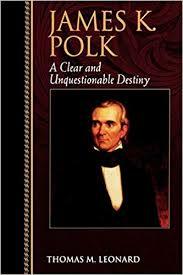 Polk's vow to govern for only one term made him a lame duck president from the very beginning. Yet, even with that handicap President Polk was able to broaden the limits of America in both land and freedom. He also made a point to address his duty and that of Congress to maintain “a plain and frugal government” and use the public monies in the best way “compatible with the public interests”. Although he is criticized today, President Polk was a good president who kept the country uppermost in his thoughts and did all he could to advance the interests of the country. Inaugural Address of Abraham Lincoln - Abraham Lincoln was first inaugurated on March 4, 1861 after walking from the Willard Hotel to the Capital. Inaugural Address of Harry Truman - Inaugural Address of Harry Truman is referred to as The Four Points, outlining his foreign policy for the United States. Inaugural Address of Ulysses S. Grant - Inaugural Address of Ulysses S. Grant was given to the American people on Thursday March 4, 1869 and addressed the importance of bringing unity to the country following the Civil War. Inaugural Address of Lyndon Johnson - Inaugural Address of Lyndon Johnson research papers discuss Lyndon Johnson taking the oath of office after Kennedy's assassination. All papers from Papers Masters are original and unique. Inaugural Address of Martin Van Buren - The Inaugural Address of Martin Van Buren reminds the population of the idealistic origins of their country in hopes of inspiring in them the kinds of behavior he attributes to their forebears. Inaugural Address of Herbert Hoover - In the Inaugural Address of Herbert Hoover he championed his plans to expand on Calvin Coolidge’s accomplishments and called on the American people to see a new vision beyond that of his predecessor. Inaugural Address of Dwight Eisenhower - Inaugural Address of Dwight Eisenhower gave his first inaugural address on Tuesday, 20 January 1953. Inaugural Address of John Kennedy - The Inaugural Address of John Kennedy instilled strength in the nation of the new generation. Inaugural Address of President Woodrow Wilson - Inaugural Address of President Woodrow Wilson research papers discuss the theme of bipartisanship in his inaugural address. Inaugural Address of Franklin Roosevelt - Inaugural Address of Franklin Roosevelt was given to the nation, promising them a period of openness, honesty, and a straightforward approach to addressing the various economic and social problems that existed. Mexican-American War - Mexican-American War research papers examine the war that was fought from 1846 to 1848 between the United States and its southern neighbor. Democracy - Democracy research papers examine the system of government in which all citizens are involved in the decision making process. Treaty of Guadalupe - The Treaty of Guadalupe had a number of long-term implications for the United States, in addition to ending armed conflict. Paper Masters writes custom research papers on Inaugural Address of James Polk.